The 710 sounds good, is reasonably priced and can be clean, nasty or anywhere in between. Can sound clean or dirty or anywhere in between using the blend control. Low noise with plenty of gain/headroom available. Will sit comfortably on a desktop, out and about, or in a rack. Controls could feel better. A little too easy to overdrive. Separate outputs for each path would have been nice. It's all in the blend with the 710. That all looks pretty straightforward doesn't it? The latest offering from UA is the Model 710 Twin-Finity mic/line/Hi-Z/DI preamp. It not only provides a tube and transistor signal path but also a blend control, enabling you to move smoothly from 100% transistor signal to a 100% tube signal or any blend of the two in varying amounts. The 710 looks great and is well laid out. 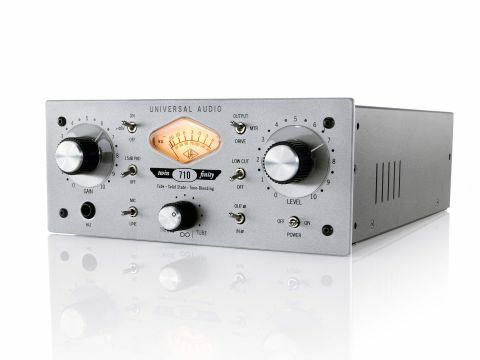 The 2U, half-rack, metal-chassis design reminds us of the Avalon U5 preamp/DI, though the 710 weighs considerably less. It can either sit upon a desktop or is rackable using the included rack-mounting kit - a nice surprise considering we normally get charged for essential extras such as this. There are three main dials on the front panel that control the two preamps' input/output and blend between the solid-state/transistor and tube signal paths. On the left is a gain control that raises the amount of gain applied to the input by a not-to-be-sniffed-at +60dBu (for the mic input), or +40dBu (using the line input or front panel Hi-Z jack input/DI). There's a 15dB pad available for high output mics as well. On the right there's a level control that acts as a master volume, attenuating the signal sent from the rear panel line out XLR (to your DAW for example). Unfortunately, there's no mic output level XLR on the 710. At the bottom centre of the front panel is the Blend dial, which is the key feature of the 710. Moving swiftly on, taking front-panel centre stage is a diamond shaped yellow-illuminated VU display that shows either the output or drive level. When set to drive, the display shows the total amount of even-order harmonic distortion occurring, which is occasionally useful, though we still find LED meters/PPMs to be more accurate than VUs in general. There is a fine complement of switching. Phantom power is provided along with a mic/line switch, a phase invert and a 75Hz low cut. All the dials and switches feel fairly sturdy but not quite as solid as we were expecting for a UA product at this price point. Now back to that unique blend control. While several other manufacturers are offering twin signal path designs, there are few (if any) that can continuously blend two signal paths. This feature enables some unique sounds to be made. You can have a totally transistor path when set to fully counter clockwise or a totally tube path when set fully clockwise. But it's the in-between bits that other preamps can't quite reach and it's here that you can truly dial in different flavours or colours that are unique to the 710. Unfortunately, though, there's no centre detent for the very useable half-and-half blend setting. The transistor preamp can sound super-clean with low input or tough and ballsy when you start to increase the gain to around 4-5. The tube preamp is definitely warmer and less precise than its transistor counterpart, but equally characterful, albeit in a subtly different way. Again, turning the gain to around 4-5 is when you really hear the character of either of the pres start to kick in, though this may be a little too soon for some. "Above all, this box really makes you experiment." Turning the gain fully up while the blend control is set to full tube gives you full-blown guitar amp style distortion/ harmonics with rounded full lows and smooth highs. Doing the same in the transistor mode again adds distortion but in a more transistor amp style (ie, a little cleaner and thinner with a tighter low end and more sizzly/ fuzzy highs). Both pres and available blends can enhance any instrument or vocal, adding sparkle, earthiness, grit or little or no character/distortion in infinite combinations. We love particularly love the 710 on synths, Rhodes, bass guitar, acoustic guitars and vocals, where it adds welcome life, body and movement. Above all, this box really makes you experiment and it's fun hearing your sound morph as you move the blend control, though this can be very subtle at low gain levels. The real fun is combining the gain and output settings and then combining these settings with the blend control. The only downsides for are that it's a little too easy to overdrive the pres and it can occasionally sound a little nasty and spiky. Also it's a shame there aren't two separate outputs for each path. This aside, UA has made a fun, intuitive, versatile and great sounding preamp. It can cover many audio bases and at just under £600 in the UK, it's sensibly priced. We challenge anyone not to find a use for a 710 in their studio.